Sales of new single-family houses in December 2017 were at a seasonally adjusted annual rate of 625,000, according to estimates released jointly today by the U.S. Census Bureau and the Department of Housing and Urban Development. This is 9.3 percent (±11.0 percent)* below the revised November rate of 689,000, but is 14.1 percent (±13.0 percent) above the December 2016 estimate of 548,000. An estimated 608,000 new homes were sold in 2017. This is 8.3 percent (±4.1 percent) above the 2016 figure of 561,000. The seasonally-adjusted estimate of new houses for sale at the end of December was 295,000. This represents a supply of 5.7 months at the current sales rate. 30-year fixed-rate mortgage (FRM) averaged 4.15 percent with an average 0.5 point for the week ending January 25, 2018, up from last week when it averaged 4.04 percent. A year ago at this time, the 30-year FRM averaged 4.19 percent. 15-year FRM this week averaged 3.62 percent with an average 0.5 point, up from last week when it averaged 3.49 percent. A year ago at this time, the 15-year FRM averaged 3.40 percent. 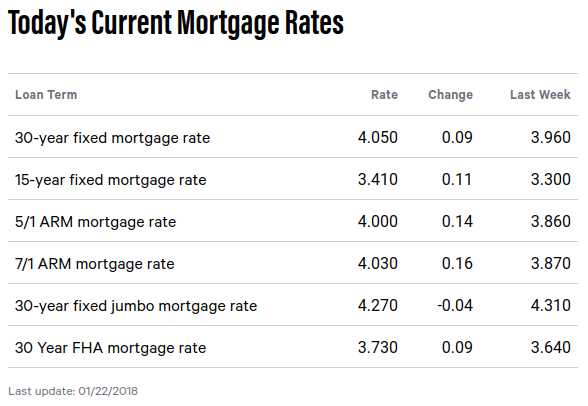 5-year Treasury-indexed hybrid adjustable-rate mortgage (ARM) averaged 3.52 percent this week with an average 0.4 point, up from last week when it averaged 3.46. A year ago at this time, the 5-year ARM averaged 3.20 percent. Len Kiefer, deputy chief economist at Freddie Mac said, “The release of the December existing home sales data confirms that 2017 was the best year for home sales in over a decade. Will 2018 home sales outpace 2017? The 30-year fixed mortgage rate on Zillow® Mortgages is currently 3.98 percent, up 10 basis points from this time last week. The 30-year fixed mortgage rate rose early last week, briefly exceeding 4 percent before drifting back to the current rate. The rate for a 15-year fixed home loan is currently 3.40 percent, and the rate for a 5-1 adjustable-rate mortgage (ARM) is 3.47 percent. The rate for a jumbo 30-year fixed loan is 4.13 percent. 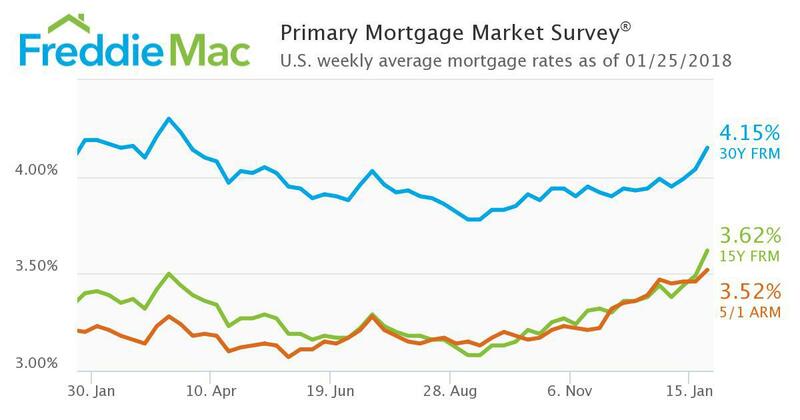 “Mortgage rates have increased decisively in two of the past three weeks, touching their highest levels since March 2017 last week, and the long-term momentum is clearly upward,” said Aaron Terrazas, senior economist at Zillow. The Market Composite Index, a measure of mortgage loan application volume, increased 4.5 percent on a seasonally adjusted basis from one week earlier. On an unadjusted basis, the Index decreased 4 percent compared with the previous week. The Refinance Index increased 1 percent from the previous week. The seasonally adjusted Purchase Index increased 6 percent from one week earlier to its highest level since April 2010. The unadjusted Purchase Index increased 2 percent compared with the previous week and was 7 percent higher than the same week one year ago. The refinance share of mortgage activity decreased to 49.4 percent of total applications from 52.2 percent the previous week. The adjustable-rate mortgage (ARM) share of activity remained unchanged at 5.2 percent of total applications. The FHA share of total applications decreased to 11.4 percent from 11.7 percent the week prior. The VA share of total applications increased to 10.9 percent from 10.7 percent the week prior. The USDA share of total applications remained unchanged at 0.8 percent from the week prior. The average contract interest rate for 30-year fixed-rate mortgages with conforming loan balances ($453,100 or less) increased to its highest level since March 2017, 4.36 percent, from 4.33 percent, with points remaining unchanged at 0.54 (including the origination fee) for 80 percent loan-to-value ratio (LTV) loans. The effective rate increased from last week. The average contract interest rate for 30-year fixed-rate mortgages with jumbo loan balances (greater than $453,100) increased to its highest level since March 2017, 4.31 percent, from 4.25 percent, with points increasing to 0.38 from 0.36 (including the origination fee) for 80 percent LTV loans. The effective rate increased from last week. The average contract interest rate for 30-year fixed-rate mortgages backed by the FHA increased to its highest level since September 2013, 4.37 percent, from 4.30 percent, with points remaining unchanged at 0.65 (including the origination fee) for 80 percent LTV loans. The effective rate increased from last week. 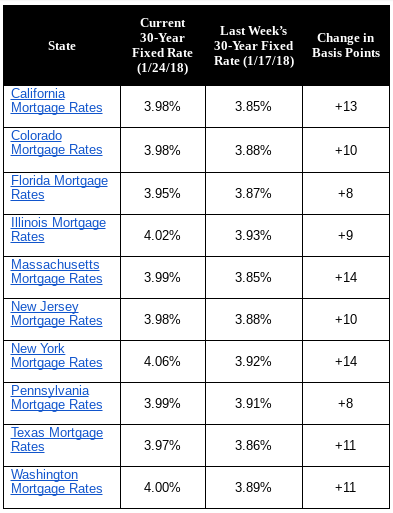 The average contract interest rate for 15-year fixed-rate mortgages increased to its highest level since September 2013, 3.81 percent, from 3.77 percent, with points increasing to 0.52 from 0.44 (including the origination fee) for 80 percent LTV loans. The effective rate increased from last week. The average contract interest rate for 5/1 ARMs increased to its highest level since April 2011, 3.70 percent, from 3.62 percent, with points decreasing to 0.39 from 0.48 (including the origination fee) for 80 percent LTV loans. The effective rate increased from last week. The average 30-year fixed-rate mortgage increased 2 basis points to 4.20 percent.